Unbelievably, it’s trade show season again already (where has the year gone!?). I always know when Summer is officially over because it’s time to register to attend Top Drawer and Home London taking place from Sunday to Tuesday at Olympia. Established home accessories and interiors brands will be displaying their wares for the forthcoming season as well as new and emerging artists and designers making their exhibition debuts. If you’re a store or gallery buyer, interior designer, or member of the press, you can register to browse the show but whether you plan to attend or not, let’s take a sneak peek at some new goods available to buy soon. Marcus has been producing idiosyncratic illustrations for large brands for many years but thankfully is now offering his distinctive prints for us to place in our homes. 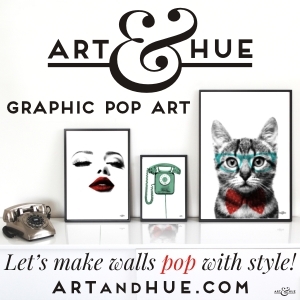 Making his debut at Top Drawer in the Spotted section for new artists and designers, Marcus Walters will be showcasing his art prints and greetings cards at Stand SP10. Home Arty Home has long been a fan of Mini Moderns and is it any wonder when they consistently introduce such great looking items? 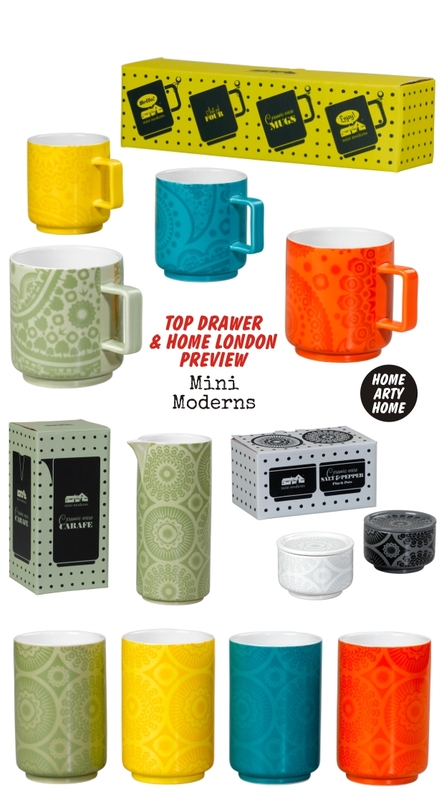 Following on from last season’s collaboration with Wild & Wolf to produce kitchenware including pans and kettles, Mini Moderns will be launching more kitchen goods at Top Drawer including these mugs, tumblers, carafes, and salt & pepper pots. Hunt them out at Stand D29. How amazing is this fine bone chinaware from Melody Rose?! I love the quirky prints and the well-conceived colour palette. The afternoon tea set with smooching couple (top of page image) is a standout collection but I would be happy to mix and match the fresh blue plates with the citrus yellows & greens to create a unique table setting. Melody Rose will be launching this new “In Colour” collection at Home London this weekend at Stand 10B. 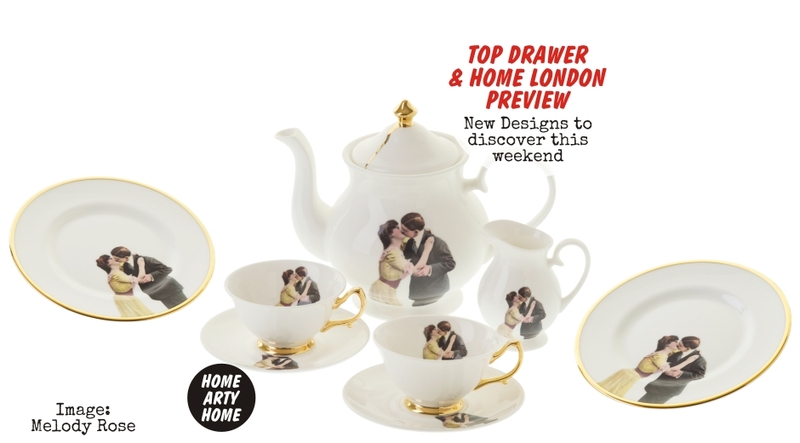 Top Drawer & Home London are taking place at Olympia on the 13th, 14th & 15th of September. Register online to attend and, who knows, we might see you there!